A student-led startup team, affiliated with UNIST has been honored by the Defense Acqusition Program Administration (DAPA) for their pivotal and impactful role played in the promotion of science and technology in the country. LOAD, a UNIST-based student startup, has recently been awarded grand prize and KRW 15 million in prize money at the "2018 Startup Competition, Using National Defense Technology". The team is reaching for growth with the funding received from DAPA. The name "LOAD" is an abbreviation for "Lab On A Drone", referring to "Lord Of All Diagnosis" with a determination to become a pioneer in environmental sampling and analysis. The team consists of four UNIST graduate students, including YuBin Kim (School of Energy and Chemical Engineering), Tae Heon Kim (School of Life Sciences), YouJin Ha (School of Life Sciences), and Sihyeong Park (School of Life Sciences). LOAD is currently working on the development of Unmanned Aerial Vehicle (UAV) systems or drones for environmental research. At the competition, the team showcased their prototype UAV system, combined with UNIST's low-cost compositional analysis platform "lab-on-a-disk" and the drone cluster technology, which is one of the national defense technologies. Current analytical methods for water-quality studies require samples to be collected on-site, then deliver to the lab for further processing. However, besides being time-consuming, such methods can lead to numerous problems, including high costs and difficulty in transporting samples. 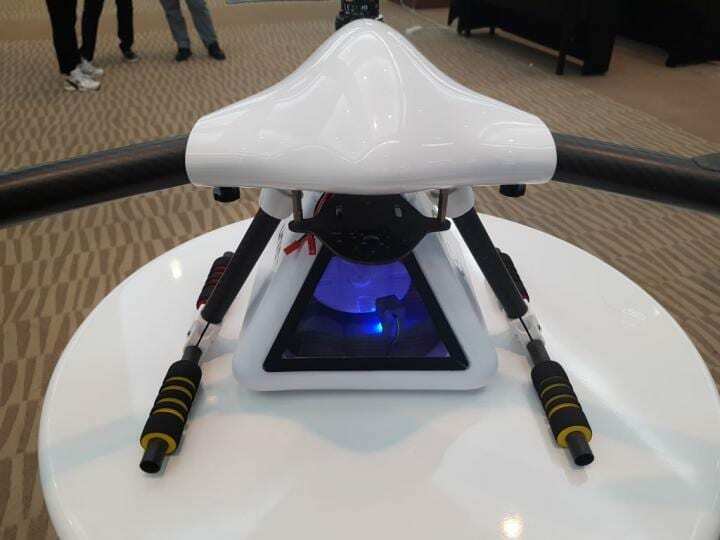 LOAD proposed a solution by deploying an analysis device on the lower part of their prototype drone to efficiently monitor water pollutants in water bodies. The new device can maximize the accuracy and speed of their data collection in a cost-effective way. "As seen in the recent report on the toxic substances present in Daegu's drinking water, poorly monitored water quality may lead to some serious damage to people's health," says the team. "The new device not only provides a simple and cost-effective solution for monitoring water quality in real life, but will aid in protecting and improving public health." YuBin Kim, who is the representative of LOAD, has been working on lab-on-a-disk area under the supervision of Professor Yoon-Kyoung Cho in the School of Life Sciences at UNIST. He has been involved in several patent applications and studies on topics closely related to Environmental & Analytical Chemistry. "I've decided to start my own business because I wanted to assist in solving real world problems with the techniques I've learned in the lab," says YuBin. "The goal is to finish developing the UAV system that can monitor water pollutants in Ulsan region." Meanwhile, the "2018 Startup Competition" has been hosted by the Defense Acqusition Program Administration (DAPA) and organized by the Agency for Defense Development (ADD). Participants in the competition showcased their startup iteams made with the national defense technologies, which have been made open to the public. The finalists who passed the screening and workshop examination received the final screening at the 2018 Defense Science and Technology Fair, which was held on Thursday, July 12, 2018. The award ceremony took place on Friday, July 13, 2018. Can seagrass help fight ocean acidification?